So E3 has come and with it the huge announcements from Microsoft, Bethesda, BioWare and whoever else you care to pay attention to. 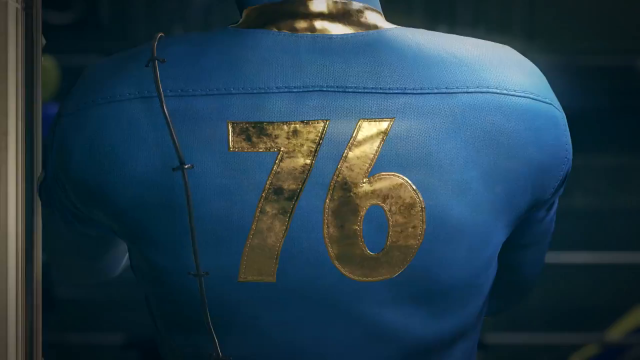 Amongst all the expected announcements – like a new Halo title, Elder Scrolls 6, and more hype and speculation about the upcoming Red Dead Redemption 2 – was an unexpected one, Fallout 76, which was teased before the E3 conference date had arrived. It was unexpected because Fallout 4 was released relatively recently in 2015. Generally, we’ve come to expect that it will go Fallout, then Elder Scrolls, and so on. But Fallout 76 is nestled between Fallout 4 and the follow-up to massive hit The Elder Scrolls V: Skyrim, which is still so early in production that it was simply teased as The Elder Scrolls VI. The new Fallout title, which is a prequel set before all the other Fallout games, is different in another big way, other than its timing. This game will be an “online-only” survival RPG, similar to Rust and DayZ. “Every non-monster character you encounter in Fallout 76 will be controlled by a living, breathing human,” writes Noelle Warner for The Nerdist. She continues that players should “think of Fallout 76 as a persistent online RPG”, but sparsely populated. You’ll be in an open world, one that is four times larger than Fallout 4, “with dozens – not hundreds and not thousands of other players”, according to Bethesda Game Studios director Todd Howard. So, you’ll be able to log on with your friends, as you please, and not be swamped by hundreds of people you don’t want to play with. Sort of like squad-based play, or alone with a bunch of others who are playing alone. It’s certainly a divisive decision, considering that the Fallout games have always been single player, and are renowned not just for gameplay but for the story. I know I tend to be wary of online-only games, because I feel like if I’ve purchased the thing, I should be able to play it whether or not I’m connected to the Internet. Having said that, having an online, explorable game set in the Fallout universe is a move that makes sense, considering the popularity of their other MMORPG, Elder Scrolls Online. Depending on how it’s done, it could either alienate players who just want the Fallout games to remain in their current style, but it could also bring in a bunch of new players, especially those who are into online games of this style. It also remains to be seen whether, like Elder Scrolls Online, you will require either a PlayStation Network or Xbox Live account to be able to play the game online at all. If that’s the case, it’s certainly a game I’ll not be picking up, despite how curious I am to explore the irradiated wastelands of West Virginia.